Festival participants hunt for mud crabs among oysters at the National Estuaries Day festival and the Mission-Aransas Reserve's 10-year anniversary. This past Saturday, the Mission-Aransas Reserve celebrated its 10th anniversary on National Estuaries Day. The event was commemorated with a festival focused on the wonders of our estuaries. We had a great turn-out with lots of hands-on activities, educational booths and seminars. 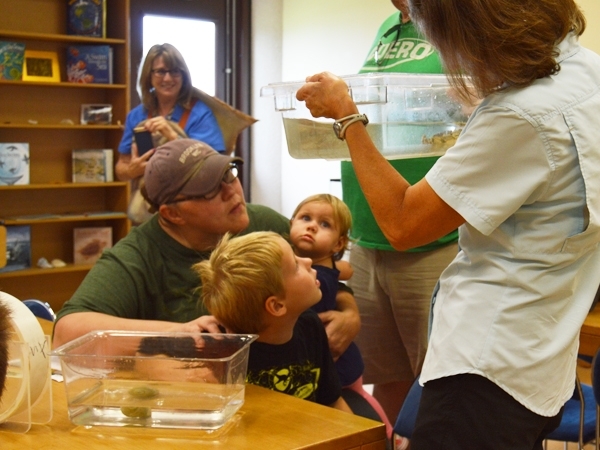 Visitors learned about the wonders of the oyster, protecting our beaches, and much more. This festival was a partnership from many local organizations focused on our coasts and estuaries. The festival is sponsored by The University of Texas Marine Science Institute, Mission-Aransas National Estuarine Research Reserve, Animal Rehabilitation Keep, Coastal Bend Bays & Estuaries Program, Texas Parks and Wildlife Department, Surfrider Foundation, Texas A&M University Corpus Christi Center for Coastal Studies, Texas State Aquarium, Natural Resources Conservation Service, and the National Park Service. Speaker presentations occurred throughout the afternoon to discuss projects that are helping us understand the importance of stories and what's being done to conserve them. Several local partner organizations provided educational booths and fun activities. The festival concluded with a cake-cutting ceremony. Reserve Director, Jace Tunnell, and NOAA liaison, Matt Chasse, cut the first slice.